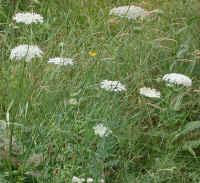 (Queen Anne's Lace (Daucus carota) - 01) Typically, Queen Anne's lace is found in dry fields and along roadsides. It can grow to heights of five feet. 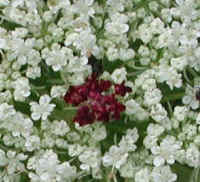 The white flowering flat-topped umbel of the Queen Anne's lace makes it easy to spot. 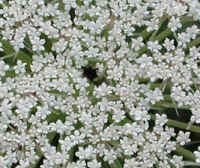 (Queen Anne's Lace (Daucus carota) - 02) This is a closer look at the umbel (flowering head) of the Queen Anne's lace, which is made up of numerous tiny flowers. 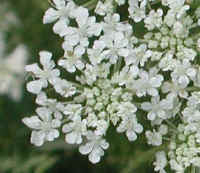 The umbel of the Queen Anne's lace can be 3-4 inches (8-10 cm.) in diameter. 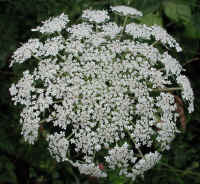 (Queen Anne's Lace (Daucus carota) - 02a) The umbel of the Queen Anne's lace is made up of several clusters of individual flowers. 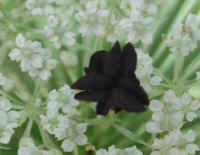 (Queen Anne's Lace (Daucus carota) - 02b) Sometimes the Queen Anne's lace produces a central deep purple flower. The literature that we read did not list this as a separate species, but only as a variant. 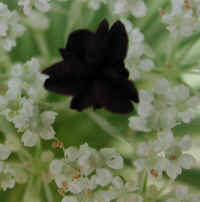 One source said "a single dark purple flower," but from this enlarged photo of the Queen Anne's lace, the deep purple center appears to be made up of several flowers. (Queen Anne's Lace (Daucus carota) - 03) Sometimes the flower clusters of the umbel of the Queen Anne's lace are more loosely packed and are more distinguishable. 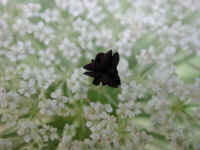 The separation on this Queen Anne's lace gives it a spiral pattern. 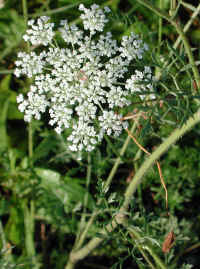 The common name of this wildflower, Queen Anne's lace, came about because people thought it resembled Queen Anne's lace headdress. 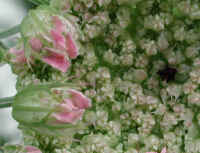 Since the flower is older than Queen Anne, perhaps she copied the delicate pattern of the umbel. (Queen Anne's Lace (Daucus carota) - 03a) This is another look at some of the flower clusters that make up the umbel of the Queen Anne's lace. (Queen Anne's Lace (Daucus carota) - 03b) This Queen Anne's lace seems to have the single deep purple center flower that the literature mentions. (Queen Anne's Lace (Daucus carota) - 04) The cup-shaped appearance of the opening Queen Anne's lace resembles a bird's nest, which gave it its other common name. (Queen Anne's Lace (Daucus carota) - 04a) Two things caught our eye on this opening Queen Anne's lace: The peripheral flower clusters' pink color that is absent in the fully developed umbel, and the fact that the central deep purple flower opens before the other flowers. We are constantly being awed by the wonderfully beautiful and seemingly unending magnificence of God's creation. (Queen Anne's Lace (Daucus carota) - 05) This is another look at the spiral pattern which develops in some of the Queen Anne's lace umbels. (Queen Anne's Lace (Daucus carota) - 06) In this photo of the Queen Anne's lace, we can see the dissected and fern-like appearance of the leaves and the hairy stems. (Queen Anne's Lace (Daucus carota) - 07) This is another look at the Queen Anne's lace umbel, leaves and stems. 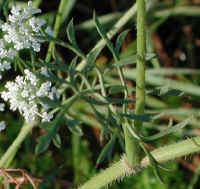 The common carrot was developed from an Asiatic form of this wild flower. 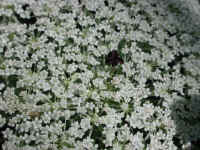 The crushed leaves have a carrot odor and the roots have a carrot taste, though they are very tough. 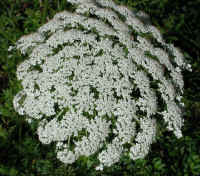 All of this led to its other common name, "wild carrot. 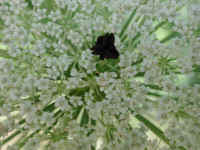 (Queen Anne's Lace (Daucus carota) - 08) One of the most interesting features of the Queen Anne's lace is that many of them have a dark purple central flower. 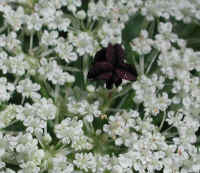 (Queen Anne's Lace (Daucus carota) - 08a) This is a closer view of the central purple flower cluster, but because of the lack of contrast, it is hard to see the flower detail. 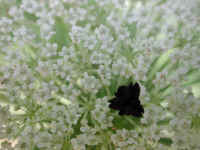 In this photo we can also see that each of the tiny white flowers have five petals, some of which are divided, and 5 stamens, which seen to fall off early. (Queen Anne's Lace (Daucus carota) - 09) This is another look at the flowers of Queen Anne's lace, with the central purple flower. (Queen Anne's Lace (Daucus carota) - 09a) This is another bee's eye view of the central purple flower of the Queen Anne's lace. (Queen Anne's Lace (Daucus carota) - 10) We took this photo of the the Queen Anne's lace in the shade, hoping that it would help the contrast with the central purple flower so that we could see the detail better, but it didn't really help. (Queen Anne's Lace (Daucus carota) - 10a) Taking the photo of the Queen Anne's lace in the shade did help the contrast with seeing the details of the white flowers, and in particular to being able to see the broken stamens, which are quite evident in the lower part of the photo. (Queen Anne's Lace (Daucus carota) - 11) This is another view of the Queen Anne's lace focusing on the central purple flower.